Competition was fierce as 25 residents of Hamiliton House embarked on a battle of style and domestic pride to see who would win the coveted Project FIND Apartment Beautiful contest. Prizes were awarded not only for the most beautiful apartment, but also the most the cleanest. First place winners received $500; second place, $250; 3rd place $125. Given one month to prepare their apartments for official viewing, the contestants swung into full action, demonstrating ingenuity and grit. A panel of four judges, Martin Espinosa from Hargrave House, Elizabeth Cunningham, Director Property Management Woodstock Hotel, and two former winners of this contest Morag Mossawir of Hargrave House and Rose Longshore of the Woodstock Hotel reviewed before and after photographs and conducted on-site inspections of all short-listed entrants. Project FIND is pleased to present the video of its first ever Apartment Beautiful contest. 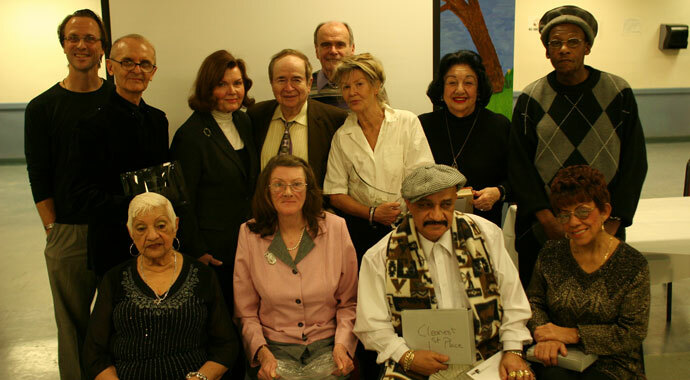 Launched in late 2007 at Project Find’s Woodstock Residence located on Midtown Manhattan’s West Side, Apartment Beautiful shows just what a group of resilient, creative seniors with moxie can do. Tough decision: Take a look at the contestants, hear from our judges, watch and listen to them in action. At the award ceremony emceed by television and radio talk show host Joe Franklin, hear from our finalists and take a look at their very inventive solutions for their tiny apartments…a must for all New Yorkas! Joe Franklin interviews the winners: “I’ve never been more excited, more at home, more at ease than chatting with you people…it’s a thrill, it’s a highlight, “said Mr. Franklin, who in 43 years in broadcast has interviewed a half million people including five presidents, Charlie Chaplin, John Wayne, Cary Grant and a host of others. Woodstock is home to 284 low-income seniors, many of them formerly among the homeless. 42 residents competed with awards going to three individuals in each of three categories: Cleanest Apartment, Most Improved Apartment and Most Beautiful Apartment. At a ceremony emceed by longtime New York City Television and Radio Host, Joe Franklin, 1st place winners received 2 months free rent while 2nd and 3rd place winners received 1 month or ½ month respectively. The contest brought out the best in all so much so that a special additional prize was added for Most Unique Apartment. “We just thought it would be a great way to showcase the ingenuity of our residents,” said David Gillcrist, Executive Director of Project FIND, “and to have fun in the process. Turning a 200 square-foot room into a personalized home is a great accomplishment and, at the Woodstock, we discovered a wealth of different and skillful approaches,” he added. Project FIND plans to continue this wonderful venture. The next site on tap is our Hargrave House facility located at 111 West 71st Street. Keep checking this site for updates. All New Yorkers stand to learn a lot from these inventive seniors!